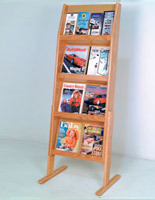 This professional wood magazine stand in handsome medium oak veneer will attract lots of attention to the contents stored! 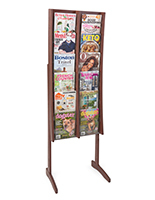 Each of these freestanding fixtures look sophisticated, while remaining affordable. 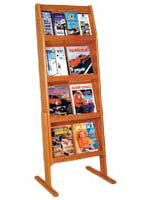 This professional wood magazine stand, also known as a retail fixture, has tons of storage for pamphlets and letter-sized periodicals. 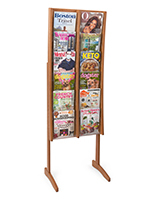 This publication display is adjustable to accommodate both catalogs and trifolds. 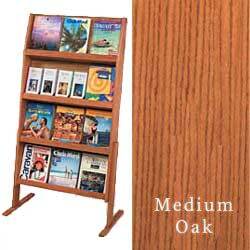 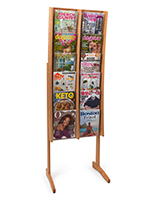 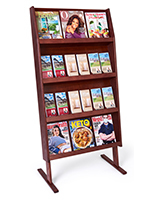 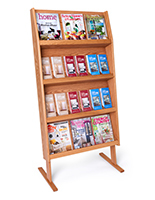 A professional wood magazine stand from our outstanding line of literature racks will go a long way toward advertising your company's goods or services, or dispensing reading material in an office waiting room. 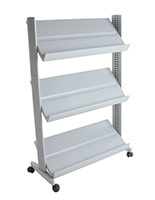 28.5" x 56.0" x 4.8"
26.8" x 11.5" x 1.3"